While depressing the clutch pedal, depress the brake pedal. Turn the engine switch to the “LOCK” position to stop the engine. If parking on a hill, shift the shift lever to 1 or R and block the wheels as needed. In the following conditions, the engine speed may become high while driving. This is due to automatic up-shifting control or down-shifting implementation to meet driving conditions. It does not indicate sudden acceleration. • Do not drive at extremely high speeds. • Do not drive continuously in low gears. 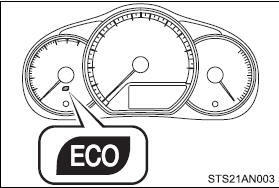 During Eco-friendly acceleration operation (Eco driving), Eco Driving Indicator Light will turn on. When the accelerator pedal is depressed excessively, and when the vehicle is stopped, the light turns off. ●The shift lever is in anything other than D.
●The vehicle speed is approximately 80 mph (130 km/h) or higher. • Make sure to keep a correct driving posture even when moving the vehicle only slightly. This allows you to depress the brake and accelerator pedals properly. ●Do not drive the vehicle over or stop the vehicle near flammable materials. The exhaust system and exhaust gases can be extremely hot. These hot parts may cause a fire if there is any flammable material nearby. ●On vehicles with an automatic transmission, do not let the vehicle roll backward while the shift lever is in a driving position, or roll forward while the shift lever is in R.
●If the smell of exhaust is noticed inside the vehicle, open the windows and check that the back door is closed. Large amounts of exhaust in the vehicle can cause driver drowsiness and an accident, resulting in death or a serious health hazard. Have the vehicle inspected by your Toyota dealer immediately. ●Do not shift the shift lever to D (vehicles with an automatic transmission) or 1 (vehicles with a manual transmission) while the vehicle is moving backward. Doing so can damage the transmission and may result in a loss of vehicle control. ●Do not adjust the positions of the steering wheel, the seat, or the inside or outside rear view mirrors while driving. Doing so may result in a loss of vehicle control that can cause accidents, resulting in death or serious injury. ●Always check that all passengers’ arms, heads or other parts of their body are not outside the vehicle, as this may result in death or serious injury. ●Sudden changes in engine speed, such as engine braking caused by upshifting and down-shifting, may cause the vehicle to skid, resulting in an accident. Be careful not to shift the shift lever with the accelerator pedal depressed. Shifting the shift lever to a gear other than P or N may lead to unexpected rapid acceleration of the vehicle that may cause an accident and result in death or serious injury. Have the brake pads checked and replaced by your Toyota dealer as soon as possible. Rotor damage may result if the pads are not replaced when needed. It is dangerous to drive the vehicle when the wear limits of the brake pads and/or those of the brake discs are exceeded. If the vehicle is in any gear other than P (vehicles with an automatic transmission only) or N, the vehicle may accelerate suddenly and unexpectedly, causing an accident. ●Do not leave glasses, cigarette lighters, spray cans, or soft drink cans in the vehicle when it is in the sun. • Gas may leak from a cigarette lighter or spray can, and may lead to a fire. • The temperature inside the vehicle may cause the plastic lenses and plastic material of glasses to deform or crack. ●Do not leave cigarette lighters in the vehicle. If a cigarette lighter is in a place such as the glove box or on the floor, it may be lit accidentally when luggage is loaded or the seat is adjusted, causing a fire. ●Do not attach adhesive discs to the windshield or windows. Do not place containers such as air fresheners on the instrument panel or dashboard. Adhesive discs or containers may act as lenses, causing a fire in the vehicle. ●Do not leave a door or window open if the curved glass is coated with a metallized film such as a silver-colored one. Reflected sunlight may cause the glass to act as a lens, causing a fire. ●Always apply the parking brake, shift the shift lever to P (vehicles with an automatic transmission only), stop the engine and lock the vehicle. ●Do not touch the exhaust pipes while the engine is running or immediately after turning the engine off. Exhaust gases include harmful carbon monoxide (CO), which is colorless and odorless. Inhaling exhaust gases may lead to death or a serious health hazard. ●If the vehicle is in a poorly ventilated area, stop the engine. In a closed area, such as a garage, exhaust gases may collect and enter the vehicle. This may lead to death or a serious health hazard. ●The exhaust system should be checked occasionally. If there is a hole or crack caused by corrosion, damage to a joint or abnormal exhaust noise, be sure to have the vehicle inspected and repaired by your Toyota dealer. Failure to do so may allow exhaust gases to enter the vehicle, resulting in death or a serious health hazard. Always turn the engine off. Otherwise, if you may accidentally move the shift lever or depress the accelerator pedal, this could cause an accident or fire due to engine overheating. Additionally, if the vehicle is parked in a poorly ventilated area, exhaust gases may collect and enter the vehicle, leading to death or a serious health hazard. ●The brake system consists of 2 individual hydraulic systems; if one of the systems fails, the other will still operate. In this case, the brake pedal should be depressed more firmly than usual and the braking distance will increase. If this happens, do not continue to drive the vehicle. Have your brakes fixed immediately. ●Do not shift gears unless the clutch pedal is fully depressed. After shifting, do not release the clutch pedal abruptly. Doing so may damage the clutch, transmission and gears. ●Observe the following to prevent the clutch from being damaged. • Do not rest your foot on the clutch pedal while driving. • Do not use any gears other than the 1st gear when starting off and moving forward. • Do not use the clutch to hold the vehicle when stopping on an uphill grade. ●Do not shift the shift lever to R when the vehicle is still moving. Doing so may damage the clutch, transmission and gears. ●Do not turn the steering wheel fully in either direction and hold it there for an extended period of time. ●The vehicle will make abnormal sounds or vibrations. ●The vehicle will lean abnormally. ●Changes in quantity and quality of engine oil, and transmission fluid, etc. ●Lubricant condition for the bearings and suspension joints (where possible), and the function of all joints, bearings, etc.